The anti-immigration bill that recently became law in Arizona has galvanized the faith community to stand with our immigrant brothers and sisters and stand against those who seek to divide our communities and distract from the real solution to our broken immigration system: comprehensive immigration reform. 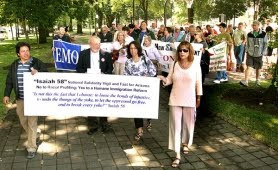 The Isaiah solidarity prayer vigil and fast across the Summer was conceived by the Interfaith Immigration Coalition, a religious left lobby group for liberalized immigration. Members include Jim Wallis’s Sojourners, United Methodist, Presbyterian, United Church of Christ, and Episcopal Church agencies, left-wing Catholic groups like Pax Christi, and the Islamic Immigration Center, among others. Evidently this particular religious left coalition, like others, deems almost any kind of immigration law enforcement as “racist” and “anti-immigrant” by definition. Condescendingly, its activists, who are overwhelmingly liberal white Anglos, assume they speak for all immigrants and U.S. Hispanics. And they ignore that in fact many legal immigrants agree with most native born U.S. citizens that security and national sovereignty require defensible borders and immigration law enforcement. While many advocates of liberalized immigration policies at least pay some lip service to border security and law enforcement, much of this religious left coalition is discomfited by either. They instead dream of a United States without borders, constantly welcoming whoever wants to enter, automatically offering tax-funded social services to everyone, and somehow atoning for, through such liberality, America’s ostensibly chronic racism and imperialism, which purportedly have generated poverty south of the border and around the world. The Isaiah prayer and fast coalition professes to “stand with our immigrant brothers and sisters,” but they are not standing with legal immigrants who struggle to find work in a recession economy and who are most imperiled by unrestricted immigration. And the utopian religious left does not accept that anybody can be “illegal,” because anyone from anywhere should be able to move into the U.S. at any time. One Catholic college president recently argued that it was idolatrous to allow free trade of commodities while restricting the movement of peoples, since the former purportedly morally elevates material goods over humans. He claimed a virtually unlimited “human right” to migrate. Human rights traditionally have argued against nations forcibly preventing their population from leaving, a la the Berlin Wall. But do human rights compel all nations automatically to grant quick entrance to all comers? The moral distinction is similar to the difference between holding a visitor in your home against his or her will, which the law typically regards as abduction or enslavement, versus requiring you to open your home to all potential uninvited guests, no matter their behavior or length of stay or attitude towards you as the owner. And as to the distinction between free trade and unlimited immigration, wheat and electronics and automobiles are perishables whose purchase and sales are regulated by the open market. Humans obviously have vastly more moral importance, require far more attention and services, exert a much larger economic and cultural impact, and, unlike televisions or cell phones, have families with their own complicated requirements. Once we’ve done it in one segment of our legal system, it’s easy to translate that into other segments of our legal system: the way we’ve treated prisoners in Guantanamo, the way we’ve treated prisoners - apparent prisoners of war — in other parts of the world is not unrelated. Here is how the religious left often sees America: a malevolent prison keeper. Every year, America invites in one million more legal immigrants, and naturalizes another one million who are already here. Probably, the U.S. is unequaled in the world in its liberality towards immigrants. But the prayers and fasters of the religious left’s “Isaiah 58 Solidarity Vigil and Fast for Arizona” coalition prefer not to admit America’s generosity, preferring their notion of America as global villain. It’s amazing that so many in the world still want to come to America, despite its supposed nastiness.